Shorebirds present include: 1 Semipalmated Plover, 8 Killdeer, 4 Solitary Sandpipers, 1 Lesser Yellowlegs, 13 Least Sandpipers, 1 Semipalmated Sandpiper. Some of the shorebirds are on gravel bars in the Raritan River viewable from the park on Duke Parkway East. One Little Blue Heron alone in Somerset County is impressive. 1 Glossy Ibis by itself is impressive. 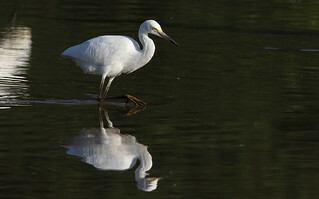 Add two Snowy Egrets (just one is extra-noteworthy), a rare visitor to both Morris and Somerset Counties, and a pair of Black-crowned Night-Herons as well as double-digit Great Egrets and the expected Great Blue and Green Herons and you have an unprecedented collection of species for the area. This event continues the exceptional year of 2014 for Herons, Egrets and Glossy Ibis in both Morris and Somerset Counties. The story of the tagged Great Egret found yesterday at Melanie Lane Wetlands in Hanover Twp. is revealed. Susan Elbin, the director of Conservation and Science at New York City Audubon, wrote that 10D was tagged at Elder’s Marsh, Jamaica Bay on 10 July 2014. Dr. Elbin is also the president of The Waterbird Society. This entry was posted in Morris County, Somerset County and tagged birding, birds, Finderne Wetlands, migration, mocosocobirds, Morris County, ornithology, somerset county. Bookmark the permalink.